What is a negative-calorie food? A food is deemed to have “no net calories” when the calories used to prepare, eat, and digest the food are equal to, or more than, the calories that the food contains. For example, the act of peeling, eating, and internally processing an orange essentially uses up all of the calories contained in the orange. 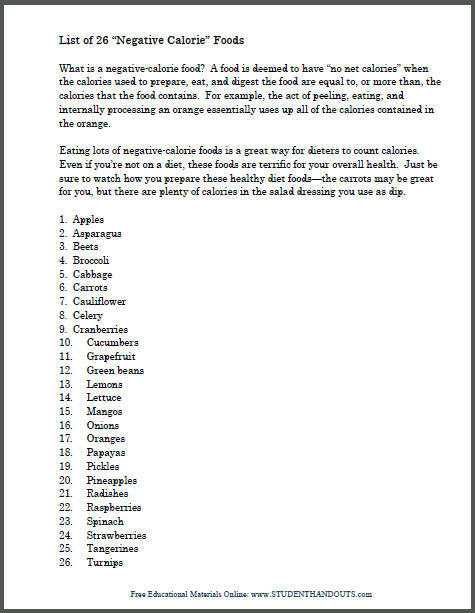 Eating lots of negative-calorie foods is a great way for dieters to count calories. Even if you’re not on a diet, these foods are terrific for your overall health. Just be sure to watch how you prepare these healthy diet foods—the carrots may be great for you, but there are plenty of calories in the salad dressing you use as dip.